Founded in 1964, Unitron is headquartered in the Waterloo region of Ontario, also known as “Canada’s Silicon Valley.” Linked with the Sonova Group, a global provider of hearing instruments, Unitron manufactures hearing aids utilizing years of research and collaboration. Unitron supports community efforts such as the Global Foundation for Children with Hearing Loss and Hear the World Foundation. Committed to making life better for people who experience hearing loss, Unitron offers a line of advanced hearing aids. Unitron’s latest sound processing platform is called Tempus, and it is based on a foundation of Unitron’s proven sound quality. Built into Unitron’s hearing technologies, Tempus provides wearers with natural sound, clean signals, and a greater dynamic range. Its wide dynamic range allows for a better sound picture without distortion, while the dual core processing performs tasks quickly. Tempus also provides wearers with better focus of sounds in noise, with seven settings for seven common sound environments. These include better focus in noise and quiet, a special music feature, and four specific to conversations: conversation in quiet, in a small group, in a crowd, and in noise. Moxi is Unitron’s receiver-in-canal family of hearing aids, powered by the North Platform. 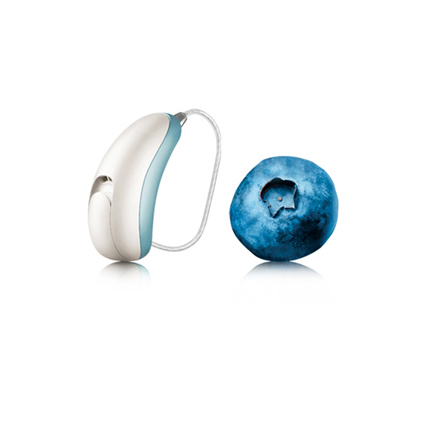 Their latest model is the Moxi Now, the smallest wireless RIC hearing aid on the market (the size of 2 blueberries stacked on top of each other!). The Moxi Now provides intuitive functionality and all day comfort, as well as all of the features of SoundNav and the North Platform. Other Moxi models include the Fit and Kiss – design award-winning models for style and functionality, and the Moxi Dura. Stride hearing aids were designed based on patient feedback, and provides satisfaction for every patient need. Advanced technology enhances conversations. Powered by the North Platform, Stride hearing aids combine SpeechZone 2 (for enhanced speech recognition), SoundNav (automatic features), and Sound Conductor (to provide natural sound) for a comfortable and effective listening experience. Stride hearing aids are available behind-the-ear and in-the-ear styles. Max hearing aids are a Super Power behind-the-ear device, designed to treat severe to profound hearing loss. Max provides enhanced speech intelligibility, natural listening, and a long battery life, and is available in three technology levels (Max 20, Max 6, and Max E). 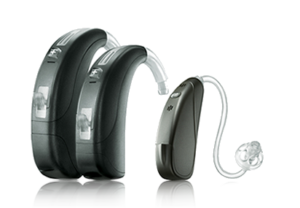 Max offers signature Unitron features found with the North Platform, as well as SmartFocus, SelfLearning, and AntiShock, to provide a comfortable experience for those who experience higher levels of hearing loss. Unitron receives feedback from audiologists, hearing aid wearers, and product experts after extensive field trials and in-clinic validations, before designing and putting a product on the market. 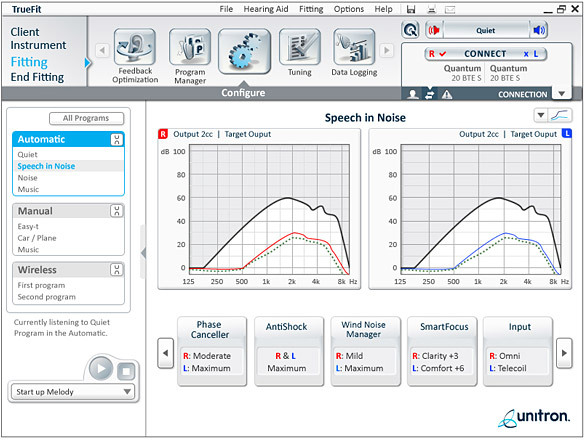 As a part of their program to provide better fitting, flexible solutions, Unitron offers a trial program and fitting software to determine the best, personalized solutions for hearing. These are TrueFit Technology and Flex. Unitron TrueFit software was developed in collaboration with hearing healthcare professionals. Hearing aid wearers are given trial hearing aids to “test drive.” During this test drive, the wearer’s preferences are recorded with a program called Log It All, which provides clear insight into the wearer’s actual listening experience. This allows hearing specialists to tailor hearing aids to their patients’ specific needs, based on lifestyle and daily activities. Log It All provides clear data on the different hearing environments that a wearer encounters during the day. Unitron’s Flex gives wearers the opportunity to try different devices to find the best fit. TrueFit Software and Flex work simultaneously to provide best hearing aid fit for their users. According to surveys, 84% of Flex customers believe that the trial experience improves their own experience with hearing aids; 83% of Flex customers report an increase in the number of patients purchasing Unitron hearing aids; and 82% of Flex customers report that the trial period helps to fit higher technology levels to hearing needs.